One of Hungary’s strengths is its well-qualified labour force. Due to the high standards of its education system, the country has a highly-skilled and talented workforce, with professional foreign language skills and relatively low wage requirements. Architecturally Hungary is a treasure trove, with everything from Roman ruins and medieval town houses to baroque churches, neoclassical public buildings, Art Nouveau bathhouses and schools. Hungary has some limited natural resources (bauxite, coal, and natural gas), as well as fertile soils and arable land. Hungarian wines are enjoyed throughout Europe. The country‘s main manufactured exports include electric and electronic equipment, machinery, foodstuff and chemicals. The country’s economy, mainly focused on the manufacturing industry, was hit hard by the latest economic crisis. The international situation became disadvantageous and debt increased. Since 2010 the economy has been recovering. The average household net financial wealth per capita is estimated at $13652. The average net adjusted disposable income of 20% of the population is an estimated $27926 per year, whereas 20% lives on an estimated $6899 a year. The main industries in Hungary are: automotive, electronics, pharmaceuticals, ICT sector, food industry. AUDI HUNGARIA MOTOR operates one of the world’s most modern high-tech engine development and production plants in Hungary since 1993 and has developed into one of the country’s major exporters and highest-revenue businesses. Mercedes-Benz also established a manufacturing plant in Hungary in 2011. The company is one of the most outstanding investors and employers in the country. OPEL Hungary was founded at the beginning of the 90’s as the first car manufacturing plant in Hungary. MOL Group (Hungarian Oil and Gas Company) is one of the largest Central European oil and gas companies, and owns a large research and production portfolio across several continents and countries such as Oman, Iraqi Kurdistan, Pakistan and Egypt. Most famous Hungarian brands are Pick Szeged Salami, Zsolnay and Herendi Porcelain, Tojaki Wines and Zwack Unicum. remained high ever since. 57% of people aged 15 to 64 in Hungary have a paid job, well below the OECD employment average of 65%. An estimated 80% of individuals with at least one tertiary education have a paid job, compared with an estimated 26% for those without an upper secondary education. People in Hungary work 1 888 hours a year, more than the OECD average of 1 765 hours. The number of Hungarians working abroad nearly quadrupled since 2010. Over a quarter-million Hungarians, or almost five per cent of Hungary’s working-age population, were working abroad for at least six months in 2013. Destination for majority of them is within the EU. 82% of adults aged 25-64 have earned the equivalent of a high-school degree, higher than the OECD average of 75%. Hungarians can expect to go through 17.5 years of education between the ages of 5 and 39, close to the OECD average of 17.7 years. The Eötvös Lóránd University, the Semmelweis University, the University of Debrecen, the University of Szeged, the Budapest University of Technology and Economics and the University of Pécs have been listed by the Center of World University Rankings in 2014. Hungary is a highly musical country whose traditional folk music inspired such great national composers as Liszt, Bartók and Kodály. Other famous Hungarians include Albert Szent-Györgyi, who discovered the existence of Vitamin C, writer and Nobel Prize-winner Imre Kertész and Oscar-winning film director István Szabó. Hungarians won gold medals at every summer Olympics except Antwerp 1920 and Los Angeles 1984 when they did not compete. Hungarians have won Nobel Prizes in every category except peace. 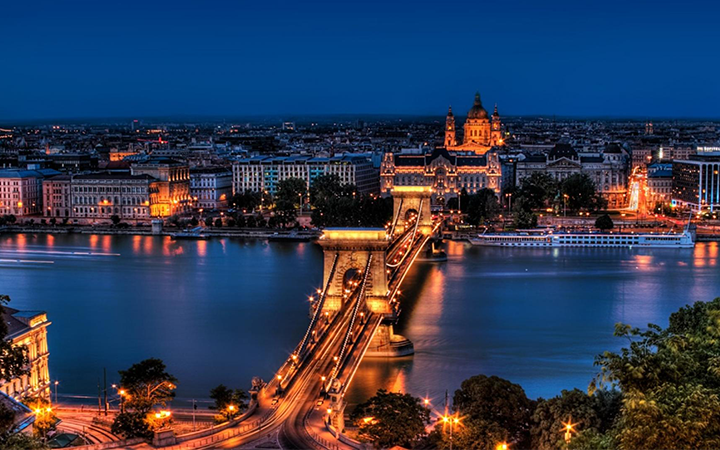 Hungary’s central location makes it a favourite destination for foreign investors. The country’s telecommunications, transport and logistics infrastructure, and the quality of education and life have attracted large amounts of foreign investment to Hungary since 1990. The capital, Budapest, is the centre of the country’s economic activity.